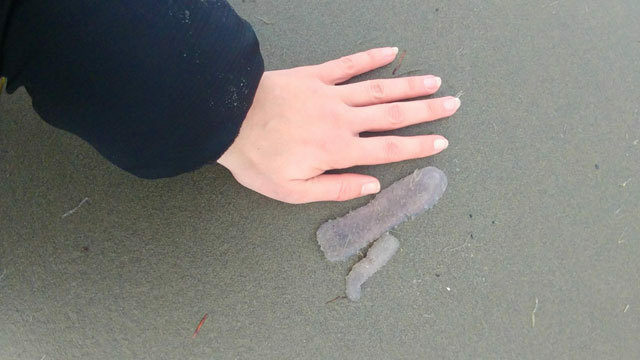 When taking a stroll on a northwest beach, a Seattle-area woman vacationing on the Oregon coast found bizarre, tubular, jellylike creatures on the sand. 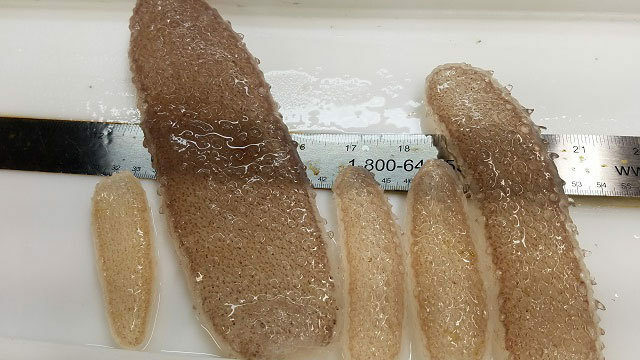 These animals called pyrosomes – or more simply referred to as “sea pickles” – made headlines over the summer because the tropical-dwelling animals started showing up in unprecedented numbers along the northwest coast this year, as far up as Alaska. It’s a never-before-seen phenomenon for northwest waters. A National Geographic research team’s net pulled up 60,000 in five minutes near Sitka, Alaska, where salmon fishermen had to take a break from their work as the tubular, spineless creatures invaded their hooks. Pyrosomes are technically a colony of other small, multicelled organisms called zooids. The colonies vary in size range depending on species. Some reach up to 30 feet in length. In Oregon, the species washing ashore is Pyrosoma atlanticum, which reaches a maximum size of only 2 feet. Pyrosoma roughly translates into “fire body,” as these strange creatures are known for emitting light through chemical reactions in their bodies. Tiffany Boothe, with Oregon’s Seaside Aquarium, took new photos of the animals on the beach Thursday morning. Some were tangled in seaweed, while others lay deflated. “They do not wash in during a particular time of year. Anytime they are this far north and close to shore, a west wind will drive them onto the beaches,” she told KIRO 7 News. No one knows exactly why they are now in the northwest. 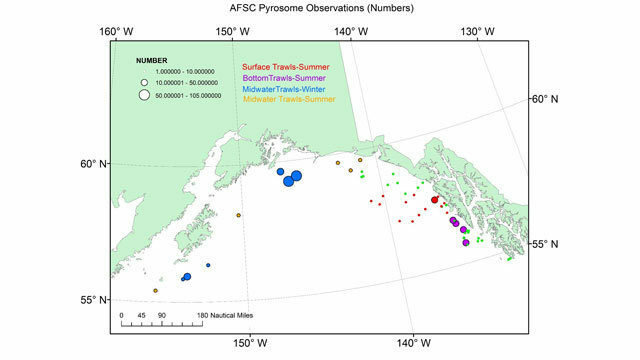 In the wake of “the blob” that heated up the North Pacific Ocean in recent years, some scientists theorize that the temperature increase made a more hospitable environment for pyrosomes. Sea surface temperatures have recently cooled to average or slightly warmer than average conditions. But a big question remains for National Oceanic and Atmospheric Administration researchers: Was this just an unusual year—a unique phenomenon—or does this reflect a lasting change that could have implications for the food web? Pyrosomes filter and ingest tiny plant and animal cells from plankton. While other animals may eat pyrosomes, these creatures may compete with other small grazers that represent more preferable or more nutritious fish prey. At this point, as researchers try to unravel these mysteries during what they call a pyrosome population explosion, there are more questions than answers.